African Cichlids, barbs, gouramis, cats, loaches… they’re all part of the world of tropical fish, and we have an excellent selection to provide a burst of color to your tank. 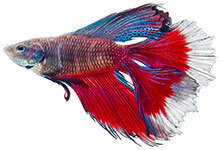 If you’re a beginner, tropical fish provide a great way to get your “fins wet” into this hobby. You can even add some natural beauty to your tank by choosing from our selection of live plants. But, if that’s not to your liking, you can select from a variety of colorful ornaments. Either way, your tank will look fantastic! To keep your tank and fish healthy, make sure you have the right equipment. Suncoast Pets carries filters, carbon, testing equipment, lighting and of course, tanks and stands. We offer an great selection from popular brands like Whisper, Marineland, Aqueon and more. And for foods, we feature both dry, live and frozen. Whatever your pet’s appetite, we have something to fill it! Live ghost shrimp, feeder guppies, a freezer full of different foods and two shelves stocked with every variety of dry flakes and pellets from fine vendors like Aqueon and Ocean Nutrition.